February | 2007 | Ipoh Mali Talak Sombong! Recently, I came across different types of ‘blogthings’ (Cool Things to Put In Your Blog) and I thought it might be interesting to put some related to one’s personality here. This is the first one: What Year Were You Born Under? However, you don’t trust others to be as ethical as you are! Straight forward and direct, you really aren’t one for small talk. You are a great listener – and an agreeable companion when you’re in a good mood! Chinese New Year celebration will end in one week time and I guess most people are already back to work. Hope everyone had a great celebration. I used to go to ‘pasar malam’ aka night market with a bunch of friends on Thursday. 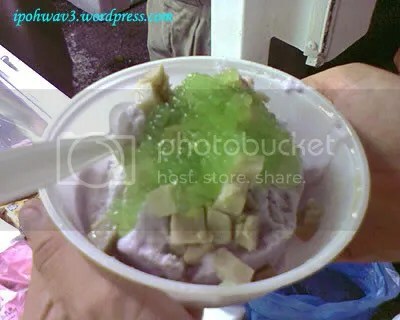 These pictures were taken a week before CNY (pardon the picture quality as they were taken using my camera phone) and we saw a new stall, selling ‘lolo’, some kind of dessert similar like ice kacang or cendol but the texture of the shaved ice is smoother. And of course, more expensive too. 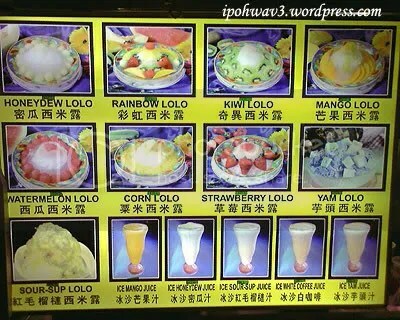 It’s hard to find ‘lolo’ in Ipoh. There’s one hawker stall at Tong Sui Kai selling but everytime we wanna have it, it’s closed. So, when my friends saw this stall, they quickly place their order. The business is quite good as there are many people waiting for their order to be prepared. But you can see, the preparation table is a bit messy, though…. If I’m not mistaken, Precious Pea blogged about her experience on having dinner alone last Wednesday (Sigh..Eating Alone…Sigh!). 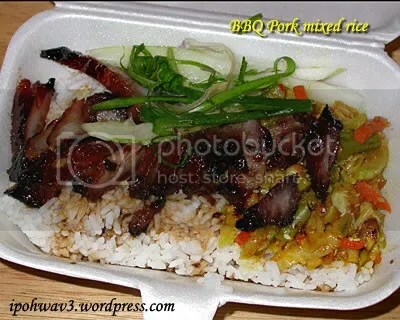 After I read her blog, I told myself, I must have BBQ Pork Rice for my lunch tomorrow, and Ta-Da..! So, I really had this on Thursday… BBQ Pork with my favourite acar! I asked the uncle to give me the lean part as I dislike the fatty part. 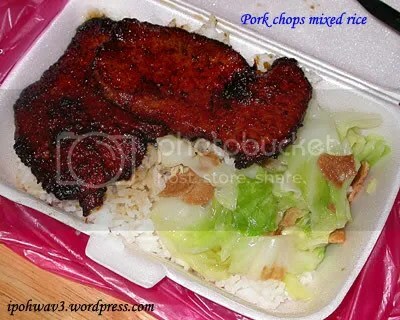 Located behind my office, this stall serves yummy roast pork, BBQ pork, chicken rice etc with veggies as side dishes. Acar is one of my favourite dish, with plenty of grounded peanut chunks. Well, this my lunch on Tuesday. 2 piece of pork chops rice with veggie. Ah.. don’t say I’m “wai sik” for having 2 piece la cos their pork chops really are good! Should have snap the photo of the shop. Btw, the dark area are not over-fried, it’s the dark soy sauce “effect”.